Having widened their focus beyond health to include many issues faced by young Southeast Asian women (and now men, with the introduction of the Young Men’s Empowerment Program), KGA combines leadership development, political education, community organizing, and arts and media work to create “gender and culture specific approaches to youth organizing.” In addition to reproductive health, KGA has tackled issues such as police harassment, and making sure Cambodians are fully counted in the 2010 census. Last year they worked with the UCLA Datacenter to survey over 500 Khmer youth about their experiences. The results, which have been written up in a visually creative report, highlight issues of police harassment, disctrimination, sexuality, reproductive health, and mental health. This participatory action research project, followed by a listening tour, has led to the launching of the new Youth at the C.O.R.E. campaign. KGA’s work targets cultural change in a couple of ways. Internally, as a feminist organization run by young women, KGA youth have engaged with expectations and restrictions on women within the Khmer community. Externally, KGA demands dignity and respect for the Southeast Asian community, which faces discrimination around race and ethnicity, as well as immigration status. And the organization’s recent demands include the need for culturally relevant curriculum in schools that serve Southeast Asian youth. 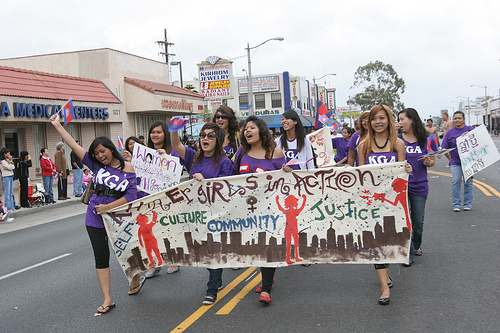 To learn more about Khmer Girls in Action, visit their website at http://www.kgalb.org/, and check out this piece at the Orange County Groups Blog.